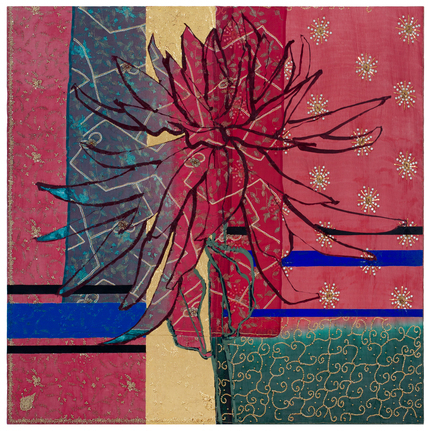 Robert Kushner, Large Red Dahlia, 2017, oil, acrylic, gold leaf, silk, embroidery, and sequins on canvas, 72 x 72". “I just want to be a good visual seducer.” So Robert Kushner, NA declared in a 1981 interview. And as we see in his current exhibition here, “Reverie: Dupatta-topia,” the artist—a pioneer of the Pattern and Decoration movement—confirms his approach to ornament as a specific way of seeing and moving through the world. In these canvases and panels, Kushner refrained from adding paint to his surfaces until the gilding and fabric collaging were finished. Though the works recall some of Kushner’s earliest pieces, what we see before us feels utterly new. In Large Red Dahlia, 2017, outlines of the flower slowly emerge from three Indian dupattas, or scarves, glued to the canvas. The fabrics overlap at certain points, creating moments that allow the viewer to glimpse exquisitely complex layers of embroideries and colorful sequins. In Mughal Tulips, 2018, the titular flowers sway against a patterned, cream-colored background, composed of four sober-looking dupattas and beautiful gold-leaf embellishments. The work calls to mind the regal interiors of the Taj Mahal. The beige-ish tulips almost blend in with their surroundings, but they don’t entirely because they are made from glitter-infused oil paint. The flowers emerge from the work, creating a subtle bas-relief effect. Kushner forces us to give up our focus on a single subject in his formally labyrinthine images. If there is a sense of narrative, it is expansive, nonlinear. He asks us to take in everything we can see. And so we do, completely bewitched by it all.